We're on vacation and I have my laptop. I'm planning to post everyday if I can. Not sure I will manage this but I will try to post within 24 hours of each vacation day. Day one started overcast and dreary and the low, June Gloomish, clouds followed us most of the day. Despite that, it was great to get on the road. When the clouds finally cleared in the afternoon, I was amazed at how big the sky is out on the plains. I felt very small and a little awed by the rolling South Dakota grasslands and the seemingly unending blue sky dotted with puffy, happy clouds. We decided to get the more touristy places out of the way on this first vacation day starting with the Mitchell, SD Corn Palace. The Corn Palace, originally built in 1892, is a big ornate auditorium/social gathering place decorated with corn. When you visit this place you have to corn-sider the a-maize-ing ear-chitecture (Sorry about that but these were all phrases on billboards along the way to Mitchell). The outside of the palace is decorated in murals made from multicolor corn – i.e. corn mosaics. We watched a movie on the origins of the palace as a way to attract new settlers to Mitchell and to promote the town as a possible capitol of South Dakota. While the palace failed to win them the capitol seat, it did attract settlers and visitors to the town. The palace has been built, moved, and rebuilt several times in it's history, each time more elaborate. While I thought the palace was a little corny, the history of the pioneer struggles to attract neighbors was interesting and informative. A few pictures are here. Back on the road west we passed hundreds of Wall Drug signs. I've never seen so many signs. To say that one out of every five was a Wall Drug sign would be an underestimation. When we arrived it was your typical, souvenir hocking, tourist trap. We walked through the rows of chochkis before stopping for some lunch – Buffalo Burgers of course. It was still early so we took a drive through Badland National Park. We'd both been there decades before. While it was beautiful, the colors were a lot brighter in my memories. I also don't remember all the green. I wish my memory was a little better. The drive through the park is a treat. On one side of the road is meadow with deer/elk/antelope grazing and prairie dogs poking their heads out of their holes and chirping at each other. The other is a surreal multi-colored desert landscape contrasting sharply with the verdant late spring plant growth. Pictures of our drive though the badlands can be found here. 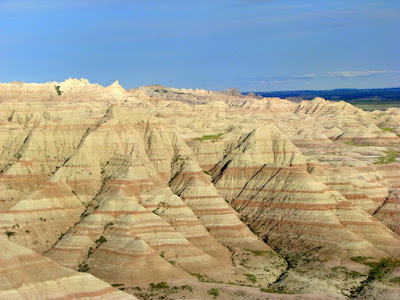 Hubby and I never made it to the Badlands. We hit the Wall Drugs, Deadwood and Mt. Rushmore, as the bikers were heading to Sturgis. Looking at your pics, I think we missed out and should have turned to wander through. GH: Everyone needs a vacation sometime. Dobegil: We didn't make it to Rushmore this time. The Wife and I have both been there years ago. 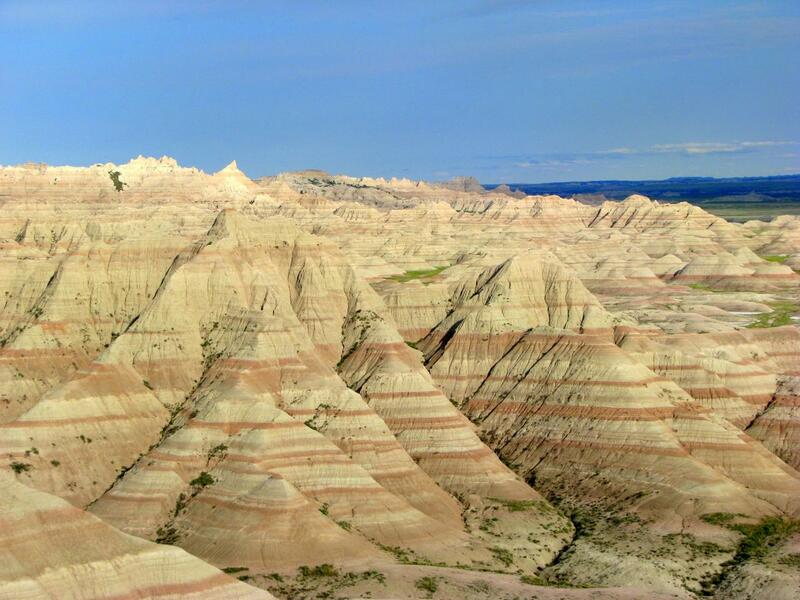 The badlands are worth the turn out. Very pretty. The Wife has a friend with family in Sturgis. We may go there sometime for the biker rally.